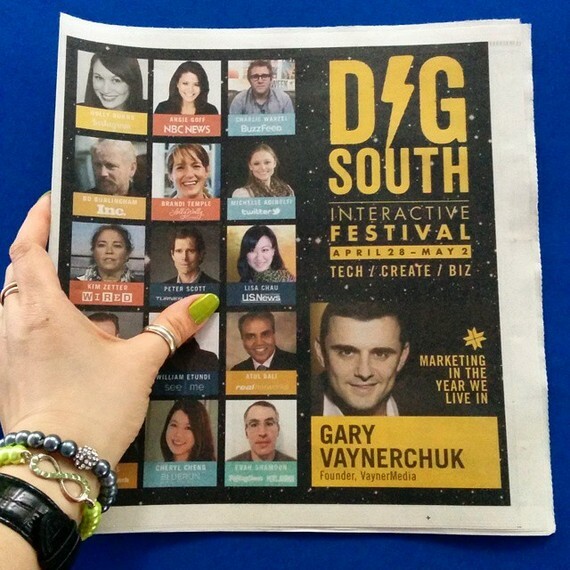 In April, I was invited to speak in Charleston's third annual DIG SOUTH -- the Southeast's first and foremost event celebrating the digital economy with over 200 presenters from companies such as Google, Instagram, Twitter, TechCrunch, BuzzFeed, and Inc. Acclaimed entrepreneur and internet personality, Gary Vaynerchuk, delivered the kickoff keynote. My media panel was moderated by NBC News anchor and Emmy-Award winning journalist, Angie Goff. DIG SOUTH functions as a showcase for Charleston as a top location for startups to launch new products, platforms, and services. Over 35 venture capital firms (managing more than $3 billion in funds combined) attended the event seeking investment opportunities. Represented companies included AOL co-founder Steve Case's Revolution Fund, Silicon Valley's BlueRun, Core Capital Partners, Comerica, and Boston Millennia Partners. "DIG SOUTH's Wild Pitch is the region's capitol of capital," said founder Stanfield Gray. 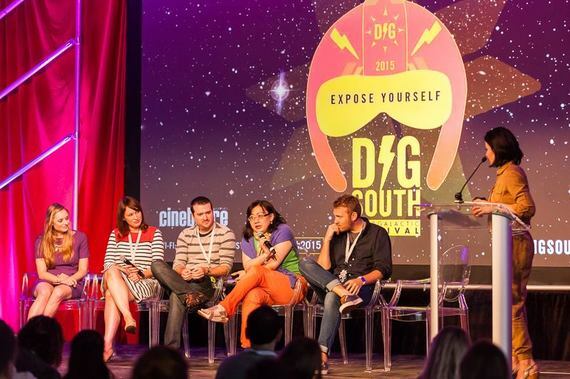 "The number one place for Southern startups to get deals done." During the event, I was surprised to learn that Charleston outpaces the nation in technology growth. Charleston, South Carolina has quickly become a surprise player in the tech growth field among giants like Silicon Valley and New York City. Usually known as a top tourism destination, Charleston has a larger percentage of employment in IT-related business than Austin or Raleigh. In fact, Post and Courier reported that Charleston's tech economy is growing 26% faster than the national average -- and just as quickly as Silicon Valley. Home to more than 200 tech companies, Charleston's fast-growing tech hub is fueled by new waves of young, creative talent flocking to the area. From 2000 to 2012, Charleston's millennial population grew 58 percent -- outpacing Nashville, Denver and Houston. Venture capitalists have also taken a keen interest in the mid-sized metro. This year, the Brookings Institution ranked Charleston #12 in the nation for venture capital "first fundings" by population and deal concentration. This year, Charleston-based, Bidr, which creates a mobile-based fundraising system for nonprofits, took home first place at DIG SOUTH's "Wild Pitch" event, earning $7,500, plus $2,700 of on-the-spot crowdsourced funding. Just one week later, Bidr took home the top prize of $100,000 from Steve Case's Rise of the Rest tour stop in Charleston. Emmy-Award winning journalist, Angie Goff moderates my media panel. The region's growth didn't happen overnight. Blackbaud, developer of software and services for nonprofits, moved to Charleston from New York 26 years ago. In 2004, the company raised $64.7 million at its IPO. Around the same time, health insurance technology company, Benefitfocus, was also founded in the region. The company raised $70.6 million from its IPO in 2013 and currently services clients like Under Armour, Dannon and New Balance. It now has a 40-acre campus in Charleston housing 750 employees. "You could count the number of technology-focused companies that were around on two hands back in 2004," said Grier Allen, CEO and Co-Founder of real estate software company, BoomTown. "Today, we have hundreds of companies ranging from your one-person, two-person startups looking for that angel round, all the way up to the Google and Boeing, which is expanding its technology arm here in Charleston. It's an exciting time to be part of Charleston's knowledge economy." Since opening in 2006, BoomTown has surpassed $8 million in revenue and now employs nearly 100 people. At the cornerstone of Charleston's tech community is the Charleston Digital Corridor (CDC), a public-private partnership that provides Charleston's entrepreneurs with community, talent, spaces and capital. Since 2009, the CDC has graduated 76 startups in its incubator spaces (called "Flagships"). For funding, local startups also have access to SC Launch, which invests $200,000 or more in select technology ventures throughout the state, and Silicon Harbor Ventures, an investor-managed fund targeting early and growth stage companies in Charleston. While these organizations provide the resources that tech companies need now, just as many are focused on ensuring Charleston has an important resource for the future: talent. "Our region's tech economy has seen tremendous growth over the past few years. To keep this momentum going, we want to make sure tech companies can find the talent they need here for years to come," said David Ginn of the Charleston Regional Development Alliance. "Between the region's top-rated restaurants, lively culture, deep history and low cost of living, Charleston is an appealing place to live and work." The Charleston Regional Development Alliance, along with a dozen of the area's top tech companies, recently unveiled a new initiative, Charleston Open Source, which will attract and connect national talent to local tech companies. •	HR software developer for the service industry, PeopleMatter, got its start with the CDC in 2009. Since then, the company has raised more than $47 million in venture capital and counts 33,000 restaurants across the country among its clients, including Wendy's, Marriott, Domino's and more. •	After cyber security firm, PhishLabs, moved into CDC's Flagship2, the company completed a $1.2 million Series A round of venture financing and has since moved to a space downtown with nearly 50 employees. •	Workforce analytics firm, Echovate, moved into CDC's Flagship last summer and has since enrolled in SC Launch. The company hopes to hire between 75 and 90 employees in Charleston over the next few years. •	BiblioBoard began with just four people and is now the world's first digital global publishing platform, offering millions of pages of content from several hundred publishers and used by thousands of libraries. While many tech positions can be done anywhere, over 11,000 people in tech occupations chose to live in Charleston. Take a look at BoomTown's interactive Charleston Tech Map. It's an exciting time to observe how and how quickly Charleston's business landscape will continue to change in the upcoming years. Data and statistics for this article collected with assistance from the Charleston Regional Development Alliance.